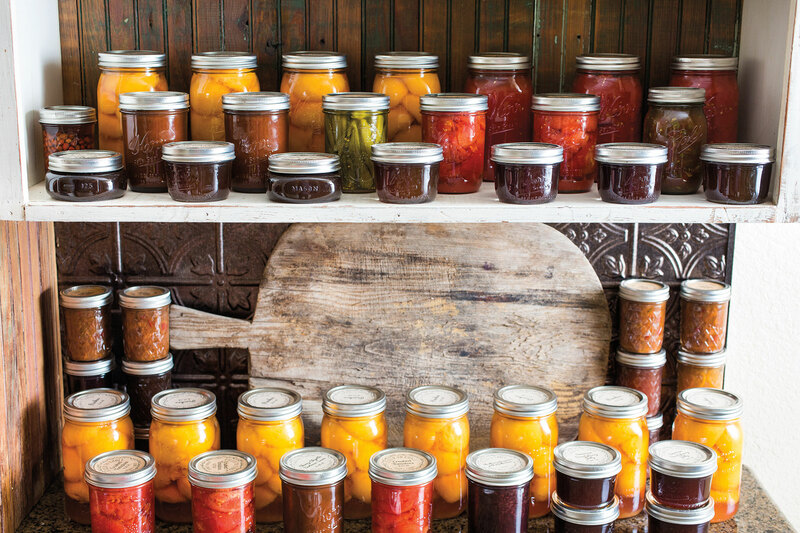 Preserved fruit and veggies line the shelves at writer Susan L. Ebert’s home. Wine-colored blackberry jams, crimson-hued strawberry preserves, ruby-red orbs of tomatoes in half-gallon jars, and glistening garnet jars of beets provided lush background tones to sunrise-gold peaches, butter-bright corn, alabaster-pale pears, snowy sauerkraut, grassy-toned green beans, and army-green glints of pickles and okra—all glimmering like mined jewels in the cellar’s cave-like gloom. “Bring up whatever you like,” Mamaw Grace would call down. I’d often make several trips. Then, canning seemed like such alchemy to me. But under my mamaw’s gentle tutelage, I learned to become proficient in helping to turn that Kentucky bluegrass farm’s well-tended vegetable gardens and wild fruit into the yearlong delights I loved. My own Montgomery County property—shielded from the sun by a canopy of tall pine, oak, elm, and hickory trees—doesn’t lend itself to prolific gardening. But my desire to preserve nature’s bounty by canning it for future enjoyment has not ebbed. What to do? I take to Texas’ highways and byways. 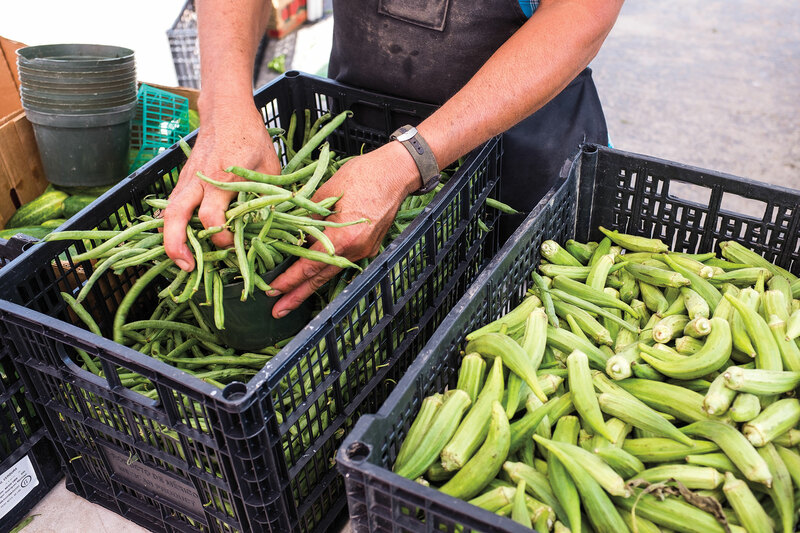 Thankfully, with the width and breadth of Texas and its long seasons, fruits and vegetables that are ready to can are available nearly year-round. Count me as one of those: My sturdy wire baskets and gardening gloves pretty much reside in the back of my Jeep year-round, so I can wheel in at a roadside stand, farm, or farmers market on a whim. And I prepare to strike at the height of freshness by studying methods and recipes well in advance, as well as stocking dozens of Ball canning jars and lids on my pantry shelf, my equipment at the ready. I wouldn’t want to come home from the Poteet Strawberry Festival, for example, with basket-loads of strawberries only to let them spoil while I race around to find recipes and buy jars, lids, seals, pectin, sweetener, and other ingredients. 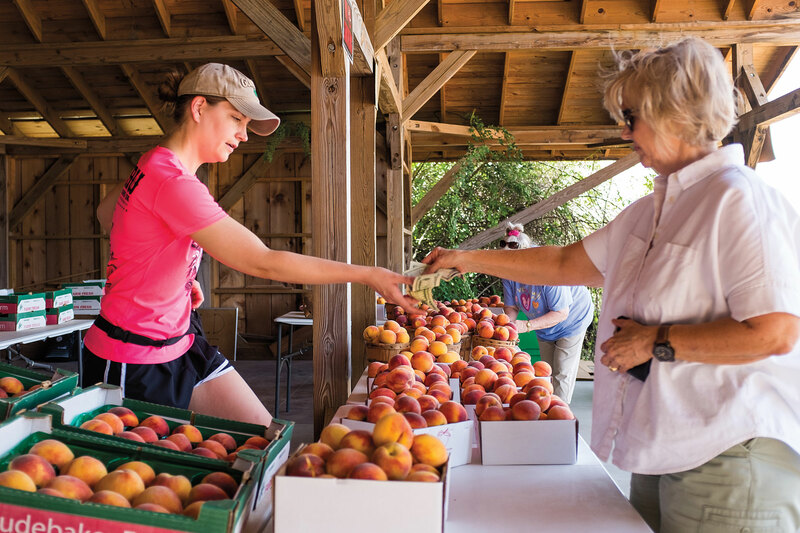 From farmers markets and festivals to pick-your-own farms and farm stands, Texas abounds with bountiful fresh fruits and vegetables all year long. Toss your baskets in the back, and let’s get started! Houston’s Urban Harvest Farmers Market. Photo: Tom McCarthy Jr. Ask once, and do so politely. These small farm-to-market growers operate on thin margins and may be averse to offering a discount; still, it never hurts to ask. For example, when I inquired about placing a bulk order with Wood Duck Farm in Cleveland, about 20 miles north of my home in Porter, owner Van Weldon offered to deliver it to my house on his way to Houston’s Urban Harvest Farmers Market. For a comprehensive listing of Texas farmers markets, visit gotexan.org/locategotexas/certifiedfarmersmarkets. Blueberry Hill Farms in Edom. 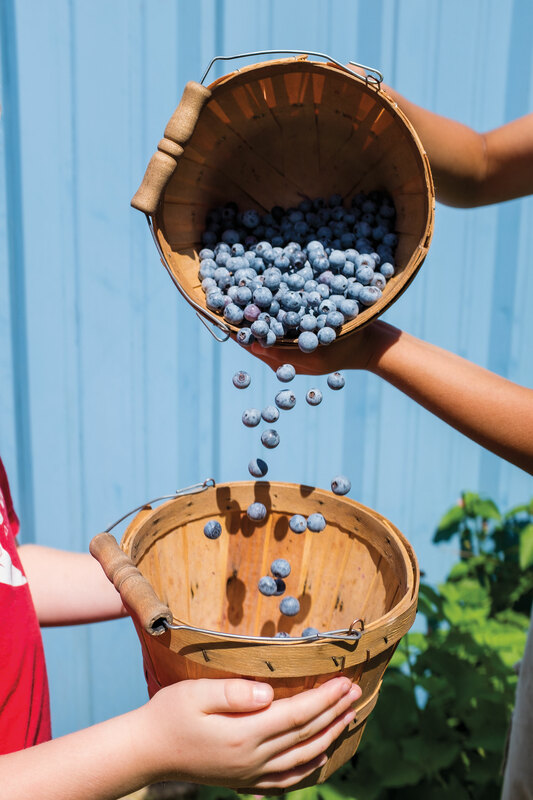 Photo: Tom McCarthy Jr.
from Moorhead’s with 30 pounds of blueberries). season in September at Idalou’s Apple Butter Festival. “We’ll often find better prices on bulk tomatoes at the roadside stands on US 69 between Alto and Jacksonville,” Lightfoot says. “We’ve found it’s worthwhile to check a number of them, as well as vendors at the festival itself, before committing to buying.” Likewise, I (much to my husband’s dismay) have been known to visit a half-dozen or more roadside peach stands along US 290 between Stonewall and Fredericksburg, buying and slurping down a peach at each before deciding where I’ll spring for a bushel. Find fresh winter citrus along the backroads of the Rio Grande Valley’s Hidalgo County, home of the certified-organic G and S Groves Farm in McAllen and a host of other roadside stands including Bachman Farms and Engert Farms in Alamo, the Lazy S Citrus Grove in Mercedes, Thompson’s Rio Pride Citrus in Weslaco, and Wernecke Citrus Farms in Mission. Studebaker Farms in Blumenthal. Photo: Tom McCarthy Jr. Visiting stands operated by farmers on their own properties ranks No. 1 as my favorite way to buy fresh produce; I’ve patronized Austin’s Boggy Creek Farm for more than two decades. I’ll visit other produce farms as my travels take me, seeking out ones that follow sustainable agriculture practices and, ideally, are certified organic. I load up at the G and S Groves stand, where their certified-organic citrus will guarantee that you’re not canning pesticide residues along with your unpeeled oranges. I’m not sure my year-round canning efforts save me money; I’ve never tallied it up, nor do I care to. What I do know is that I experience the joy in sourcing the best of Texas’ fresh fruits and vegetables and of preserving the peak harvest all year long. I get the satisfaction of mastering a core culinary skill, and the pride of serving my home-canned foods to friends and family. Plus, I know Mamaw Grace would be pleased as punch. 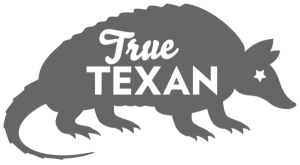 Food preservation classes are offered on a yearly basis at the Texas A&M AgriLife Extension office in Austin, and at various other locations around the state. Contact your local county agent to determine availability of classes near you. High-acid foods, such as fruit (including tomato) salsas, relishes, jellies, jams, preserves, and sauces can be processed in a water-bath canner, which reaches 212 degrees. Low-acid foods such as moles, chilis, stews, meats, poultry, and seafood must be heat-processed in a pressure canner so that the temperature rises to 240 degrees, which prevents the formation of Clostridium botulinum, a deadly toxin.